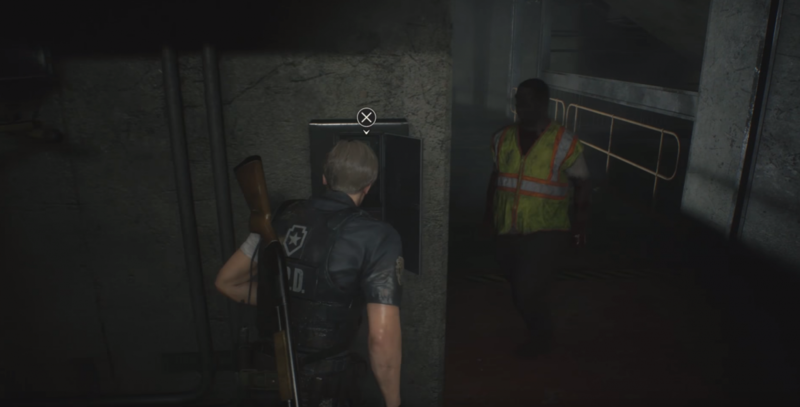 If you followed Part 4 of our Resident Evil 2 Remake S Rank guide, you should be switching back to Leon at the start of the sewer area. Read on for how to save Ada. As soon as you start, head straight for the elevator and ride it up. Go down the stairs in the next room, then drop down into the sewers below. Follow the waterway forward, take a right at the end, then head down the right-hand opening. Climb out on the right when you can, then head up the stairs. Go right the the top, then deal with the zombie there. Head right to the north of this area, deal with the zombie, then take the stairs down on your right, into the Lower Waterway. Grab the combat knife, drop down, then head right and slide down the slope. Keep following the waterway and you’ll eventually come up against a G. You can either bypass it by using a last ditch item like the knife or a grenade when it grabs you, or you can take it out – the latter takes time and ammo. Climb up on your left, then follow the passageway left and up the stairs. Climb the ladder at the top. The combination for the locker in the next room is SZF. This gets you some MAG Ammo. Drop down the shaft next to the locker to trigger a cutscene. You’re now in a safe room. It’s important here that you have at least five free slots of inventory space – preferably six. 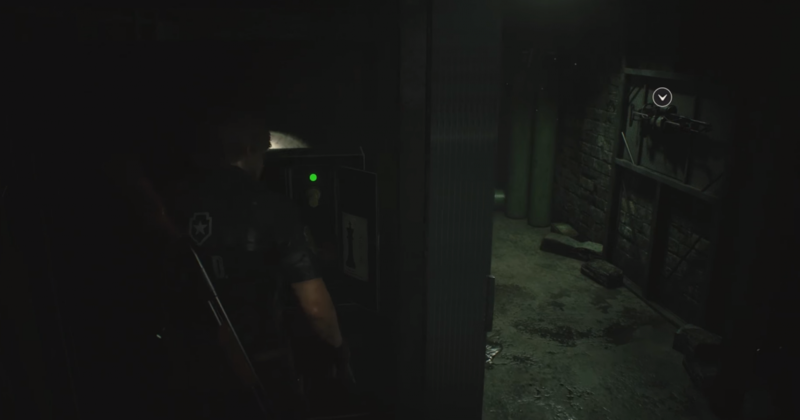 Grab the ammo from near the control panels and exit through the door with a fire extinguisher near it. Pull the lever outside to lower a walkway, then cross it and follow it around to the right to open the safe there. If you want the herb near the safe, shoot the zombie playing dead next to it first. The safe combination is left 2, right 12, left 8. This gets you a Shotgun Stock. Don’t go through the nearby door yet. Instead, follow the walkway around the other way, towards the cable car. You need to grab a Tool from there before you head to the door. Now go through the door. Go down the stairs and deal with the zombies there so you can get past and go left. Use the Tool to open the shutter there. Follow the walkway around, grab the Key from the box, then drop down in the gap to the sewers below. Follow the waterway until you can climb up near some corpses, then drop down into the water on the other side. You need to keep going until you get all the way to the other side of the room – it’s best to avoid the massive mutants, rather than fighting them. Once you get to the other side, climb up and go through the door. Head up the stairs and follow the walkway around until you come down some more stairs. Turn left at the bottom and through the open door, then grab the Queen Plug from the other side of the door. The door will then shut. There’s another electrical box around the corner on your left – slot the Queen Plug there and head through. Before you go up these stairs, take note of the zombie splayed over the railing above. It’s easier to get a cheeky shot in while it’s laid out and deal with it now than later. Now go up the stairs, through the door, and grab the King Plug. Now drop down. Don’t grab the Queen Plug yet. Instead, head back through that door and pop the King Plug in the slot near the foot of the stairs you just climbed. This gets you the Chemical Flamethrower. Now back through the door, grab the King Plug, and back through the other door to grab the Queen Plug. Now put the Queen Plug back where you originally got it from, go through the door, and slot the King Plug in the power box on the left. Now grab the Queen Plug, go through the King Plug door and grab that, then head back to the sewer filled with mutants. Use the flamethrower to deal with the first G blocking your way, then head in a straight line, staying on the left side of this waterway, right for the other side. You have to climb up one area, then drop down, then you’ll come to a ladder you need to climb. At the top of the ladder, take a right, and get back to that room where the zombies were, just before you used the Tool. In here, there’s a switch to pull in the corner. Pull that, drop down, and go through the sewer it opened up. Run forward, avoid the mutant that spills out of the pipe on your right, then climb up on your right just after it. Grab the Blue Herb, then use the Tool to open the door. There are some Shotgun Shells inside – get those, then take the elevator up. Grab the Hip Pouch and Handgun Ammo from this room, then move the latch on the door and exit. When you get through the door, grab the Rook Plug from the panel on your left, then carry on around the walkway to the right and take the stairs down. Keep going down until you drop into the sewers again, then head left, right towards the steel bars in the distance. Just to the left of these, there’s another place to climb up and use the Tool to open a new route back. Go through the new doorway, down the stairs, then follow the walkway back around to where those zombies were earlier again – where you pulled the switch. But rather than dropping into the sewer, head up the stairs on the right. Now go over the walkway bridge in the cable car room and back to the safe room. Now it’s time for the chess piece puzzle. Grab the Knight Plug from the middle slot and move it one space to the right, into the power box with the picture of the Knight on it. Take out the Bishop Plug from the slot opposite. Put the Rook Plug next to the Knight and put the Queen Plug opposite it. Put the King Plug to the left of the Queen Plug. Leave the Pawn Plug where it is and put the Bishop Plug opposite it. This opens the door to the next area. Head down the stairs, turn left, then turn right and go through the door ahead. Interact with the generator in here and flick up all of the switches except the second from the right. Now get ready for William Birkin who will claw at the door when you attempt to leave. Here Birkin will try slash you through the ceiling with his claws. You need to just run up and down the room to avoid him. Watch out for the far corner of the room where the fire is, as it spreads. Eventually, he’ll tear down the other door and you need to get around him and run through. Keep running until you drop down onto a platform with a storage container on it. Run around the side of the container and hit the button on the console. Now you need to draw Birkin to where the container was and hit him with everything you have. When he takes a knee, hit the button again. The container will swing back and hit him – make sure you are next to the console when this happens or you’ll die. Do this once more to finish him off. For now. Grab what items you can, then head over the bridge created by the broken scaffolding. 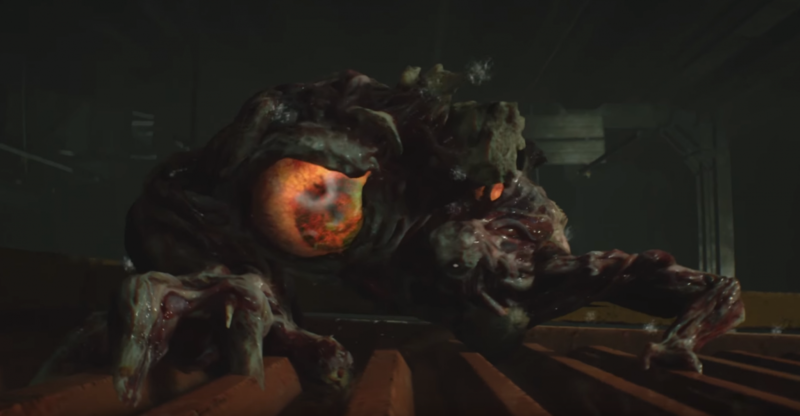 Check out part 6 of our Resident Evil 2 Remake walkthrough for the Nest Laboratory. The post Resident Evil 2 Remake – S Rank Leon A walkthrough Part 5: Sewers and chess puzzle appeared first on VG247.